Viveltre’s gourmet flavored coffees will take your coffee experience to new levels. Rich in sweet vanilla flavors, our aromatic French Vanilla coffee creates the perfect cup to begin your day. The warmth of vanilla paired with a light creamy flavor lends itself to a cup that is smooth and subtly sweet in flavor. This deliciously creamy and fragrant light roast will leave you happily satisfied. 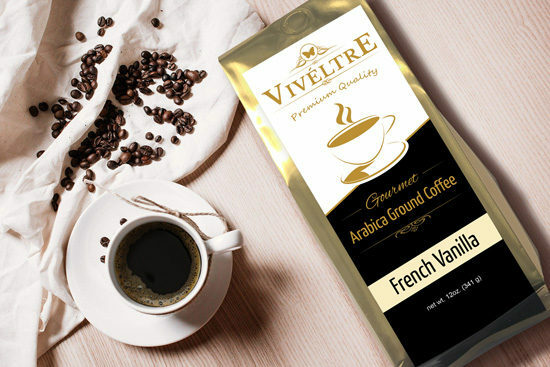 Viveltre’s gourmet flavored coffee is locally brewed in small batches, ensuring the quality of taste. Viveltre gourmet flavored coffees use a light roast of arabica beans to high light the flavor profiles. Viveltre gourmet flavored coffee uses green coffee roasters in an effort to reduce our carbon footprint. Enjoy our gourmet blends for a simply delightful coffee drinking experience.